"A girl struck by lightning hundreds of times holds the fate of the world in her hands." 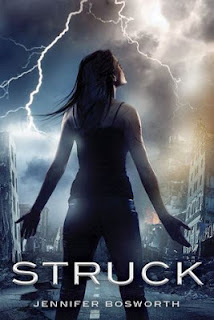 That's on the cover of the advanced reader copy of Jennifer Bosworth's debut YA novel STRUCK. Full disclosure: Jennifer Bosworth is a friend. No, not just a Facebook "friend"... I've actually met her. I even provided my extraordinary acting skills (stop laughing!) to the production of her book trailer (okay, so I was an extra... I was still epic!). Needless to say, even without the killer hook, I was more than ready to read this novel. As I cracked the book open, an unfortunate memory came to mind... I had just finished another YA novel that had left me disappointed (I'm being kind). Are you in my state of mind yet? I had been looking forward to STRUCK for months, now another book had left me a bit jaded. So, you ask, was the book good? Well, yes. It was great! And it was great without formulas... instead, she relied on something very old-school... story telling. Many can write a book, very few can write an engaging story. The first thing that you'll notice is that STRUCK is written in first person past tense--and I loved that. It was very appropriate for this story. It reminded me of campfires with friends spinning a good story. Then you meet Mia. She is the lightning addict, the answer, the problem, and the voice of the story. A memorable character whose imperfection and inner struggles make her vivid and memorable. This is a sensory-rich book. Because Jennifer Bosworth is a screenwriter, she was able to harness her magic to create a visual world. To her credit, she does this without inundating the reader with mind-numbing detail. She gets us there with just the right amount of context and detail. Also, the scenes are crisp and the chapters tight. Long chapters mean long scenes. Long scenes usually translate to slow pacing. Slow pace feels like a marathon (marathons are overrated). This book starts fast, then transforms into a sprint! And when the book ends, the reader is left complete. No need to wait 12+ months just to see what happens next, and next, and next. You get the story all in one book. How quaint! Finally, for me, the hallmark of a good story is when at the end I am left stranded in the story world--not quite ready to leave. And that's what STRUCK accomplished. A great book, written by a talented story teller. I highly recommend STRUCK by Jennifer Bosworth. It will be released on May 8th, 2012. You can go on Amazon or any other booksellers and pre-order it today. I would have said those same words, but Jay Asher beat me to it. Well played, Asher. Well played. Hi Bluddy, I wasn't a big YA fan either until about two years ago. Now I'm a huge fan (not that I've gained weight or grown taller, rather I buy a lot of YA now).